A range of factors and trends influence how CIPO will respond to a new generation of innovation challenges. For instance, all intellectual property offices must be prepared to deal with fluctuating economic conditions that affect the volume of IP applications and the evolution of IP policy and practices that occur because of evolving body of law. Outside of these realities, the most broadly acknowledged trends have been the growth of IP as a business asset and its increasingly international nature. While IP law is domestic in nature, some elements of national rights have gradually become incompatible with the fact that innovators operate on a global stage. Because the commercialization of their ideas occurs at the multinational level, they need to register their IP rights in many countries. Pressure has therefore increased on IP systems to provide a cost-effective way to obtain reliable and high-quality IP rights in multiple jurisdictions so that innovators can effectively tap into existing and rapidly emerging new markets. The rapid growth of IP investment is also one of the marked changes in the innovation landscape. Business models have emerged where IP is a central element establishing value and potential growth. Firms now invest significantly more in intangible than in tangible assets and many depend on IP licensing to help increase revenues. The World Intellectual Property Organization (WIPO) has noted that rising royalty and licensing fees, the significant growth in knowledge markets based on IP rights and the rising share of patents that list inventors from more than one country are all evidence of the growing demand for IP. It follows that as IP rights have become more and more central to the global business strategies of successful firms, IP has also become essential to economic growth and innovation policy. In response, ensuring that the right IP frameworks and incentives are in place to leverage IP is a key goal of many governments. To manage the growing demand for the protection of ideas, and recognizing that timely IP decisions help innovators quickly develop, monetize and globally commercialize their ideas, measures such as international work sharing and harmonization initiatives are being implemented across intellectual property offices (IPOs) globally. Efforts are also underway in many IPOs to increase the functionality of their information technology services to respond more efficiently to modern business needs. As new types of innovation and technologies continue to challenge existing laws, and new players introduce policy shifts, achieving success in leveraging IP also hinges on understanding how IP frameworks affect economic growth. Accordingly, there is increasing emphasis on the need to strengthen understanding of business IP strategies and producing stronger evidence-based policies. In light of this dynamic and evolving global context, IP systems must align themselves more closely with economic strategies to increase growth. To support this evolution, CIPO has recast its mission and vision statements. While CIPO has always been concerned with new knowledge, its encouragement and its protection, we are turning our focus to the ways in which we can encourage business success, invention and discovery in Canada. administering Canada's IP system and office efficiently and effectively. Our leadership and expertise in intellectual property support creativity, enhance innovation and contribute to economic success. 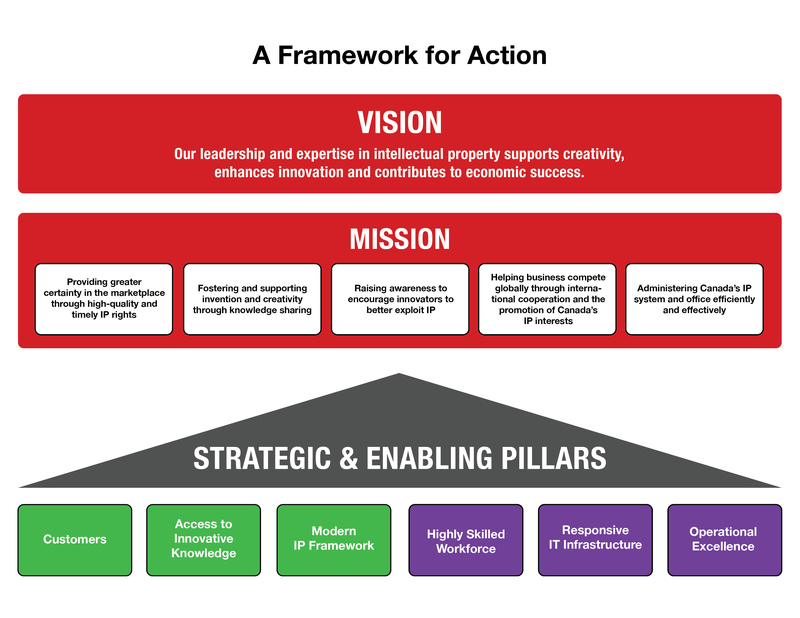 Based on our new vision and mission statements, CIPO's business strategy aims to strengthen the role of IP to support Canada's innovative capacity and output. The Business Strategy is comprised of strategic and enabling pillars that focus on CIPO's substantive business. The improvements and changes made through strategic pillars will focus our service offerings, increase our contribution to both within government and to the public and provide real change to the role IP plays in innovation. Customers: We will develop a deeper understanding of the needs of the innovators and businesses that generate ideas and wealth in order to provide the information and services they need to successfully leverage IP for innovation and economic success. Access to Innovative Knowledge: We will ensure more effective information dissemination throughout the innovation cycle to encourage the development of new products and processes through the exploitation of accessible knowledge. Modern IP Framework: By reducing red tape and aligning the IP regulatory and administrative framework with international best practices, and in support of innovation, competitiveness, increased clarity and certainty, we will help enhance the commercial success of Canadian businesses. The enabling pillars will result in improvements in the way we carry out our day-to-day activities, develop the foundation required to provide new and innovative services and modes of communication, and provide an effective and informed workforce. Highly Skilled Workforce: For CIPO to play an integral role in the innovation process, we need to be a flexible, knowledge-intensive and learning-based organization that can attract and retain the most qualified people who understand the innovation benefits of IP. Responsive IT Infrastructure: A responsive and modern IT system is critical to encouraging innovation, maintaining a modern regulatory framework, and providing efficient services and accessible knowledge. Operational Excellence: A strong and sustainable capability to manage business operations effectively and efficiently while meeting the needs of customers/stakeholders will ensure we provide quality IP rights in a timely and cost-effective manner. CIPO will implement a performance measurement system that will ensure the ongoing monitoring and assessment of our performance. Performance measurement allows us to track our progress against our goals, while striving to administer Canada's IP system in a manner that is effective, efficient, and responsive to our customers' needs and expectations. This will support informed and timely decision-making with respect to setting priorities and, when required, taking a course of corrective action. The objective is to make clear linkages between management decisions and our performance against the Business Strategy. The organization as a whole will share accountability for the success of the Business Strategy. CIPO recognizes the importance of defining what success will look like. It is only in this way that we can truly know whether we have achieved our goals. For this reason, and to support our performance measurement efforts, we have identified end-states for each of the strategic and enabling pillars. Measures of success against each of these end-states will include the performance of the organization in attaining the respective priorities. Measurements will begin at the activity level and are connected by priorities to the strategic and enabling pillars of the Business Strategy. For each of the activities that support the respective priority, we will establish baselines and realistic, yet challenging, targets.